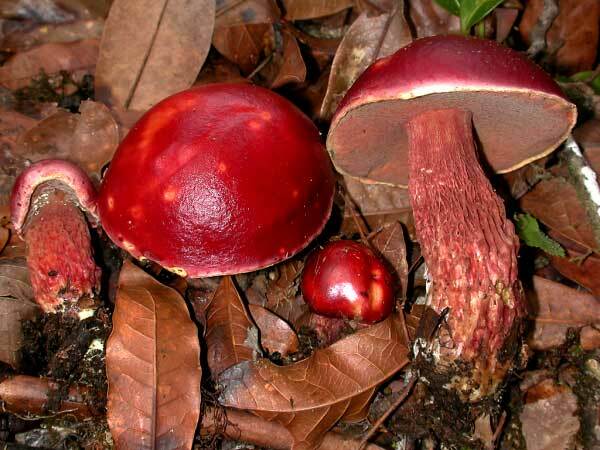 Arguably one of the most distinctive boletes, B. frostii is not likely to be confused with any other member of the family. The intense red colors pervade the entire basidioma, along with a viscid pileus, red pores that exude yellow moisture droplets when fresh, and a lacunose/coarsely reticulate stipe that also serve as diagnostic features. All portions stain blue with injury. The species is known in Costa Rica from Braulio Carrillo National Park to just south of Cerro de la Muerte near Villa Mills. Known associates are Quercus copeyensis, Q. costaricensis, Q. rapurahuensis, and Q. seemanii. Exsudoporus is another genus name used for this species.